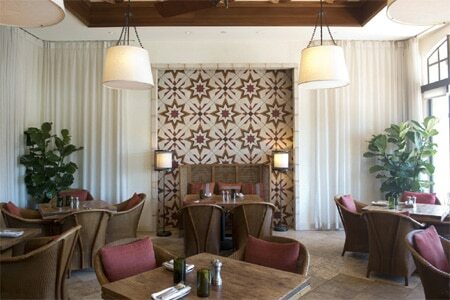 Finch & Fork crafts seasonal menus reflective of the diversity of Santa Barbara. : Located inside Canary, A Kimpton Hotel, Finch & Fork offers multiple dining areas with booths, and tables of predominantly classic wood tones. It's open without being noisy and large enough for gatherings yet intimate as well for a clandestine dinner. Chef James Siao aims to use just six ingredients per dish to maximize flavor, and indeed they pop in starters like fried chicken sliders with cilantro slaw and smoked honey mustard, and the skillet of tender cauliflower, broccoli and capers. He is also into house-made pickles, jams and chutneys. Entrées include a chicken and kale salad mixed with feta cheese, toasted pine nuts and Greek yogurt, and pan-seared sea bass with crispy Brussels sprouts, citrus hollandaise and bacon. Desserts, too, are worth your time. We like the carrot cake, which is atypically made with carrot purée, candied walnuts and a cream cheese ice cream. There is a focus on craft cocktails and an extensive brown spirits list curated by the in-house mixologist; the wine list excels at mainly regional wines to reflect the food.